5G is short for ‘fifth generation mobile networks’. And that’s literally what it is – the fifth generation of mobile networks (with a mobile network being what you use to call, text and – when not connected to a Wi-Fi network – get online). But it’s set to be far faster than previous generations, and unlike 4G it could open up whole new use cases for mobile data. According to the CEO of Qualcomm: “5G will have an impact similar to the introduction of electricity or the car, affecting entire economies and benefiting entire societies.” Many of the benefits probably aren’t yet apparent to us. 5G is not a single wireless technology, but an umbrella term used to categorise the fifth generation of wireless communication, offering networks that will allow much faster downloads through a combination of high speeds, massive bandwidth and super low latency. Some Telco experts are going so far as to call the arrival of 5G as the advent of the fourth industrial revolution. It will drive innovation such as even smarter cities, better connected cars and advancements in medical technologies. But generational change in mobile communications doesn’t just happen overnight. It requires significant effort in research and development and the resources necessary to support that effort. A 2016 report suggested that nationwide 5G coverage for the United States would probably cost more than $300 billion. Cyber and D&O Underwriters alike will want to know that, where relevant, our clients are preparing for 5G – transitioning will be expensive and will take time – to make sure they are ready to compete / not become obsolete. The health impact must be studied (cell towers effectively send out waves of radiation), environmental impact (health of birds & bees etc), and until the potential impact is known, new exclusions may start to appear on policies. 5G will also play a major role in IoT. We will certainly see increased appetite for Cyber combined with BI/PD coverage and possibly to include Recall coverages. The range of new 5G technologies is underpinned by a fundamentally unique architecture. Telco carriers & cable providers will need to invest in and possibly totally overhaul their network to stay relevant. T Mobile & Sprint are trying to merge in order to be better equipped to create 5G networks. Verizon is the first 5G service to launch. For you stock watchers there may just be a network equipment boom on the horizon rivaling the late 90s… All these new cells will still be connected by a robust wire network, meaning we will need a lot more fiber optic lines to power it. As a result, cable companies with existing fiber-based wire-line networks (like Verizon) are better suited to meet the architecture requirements of a 5G network. What’s so new about the architecture? All modern communication depends on controlling signals within the electromagnetic spectrum. 5G uses unique frequencies that are higher than those used by 4G (an example of a frequency is either a radio station or a TV channel). The image below might help make this less abstract. 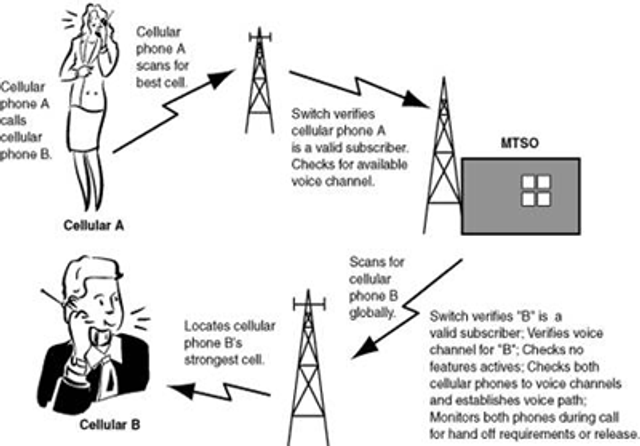 When you chat on your mobile phone, your phone converts your voice into an electrical signal, which is then transmitted via radio waves to the nearest cell tower. All of these towers will either need to be adjusted (retrofit) or replaced to catch this higher frequency. 5G also uses shorter wavelengths than 4G. In addition to concerns that these shorter wavelengths present a health & environmental risk, it means to enable phone coverage/connection there will need to be new, smaller, cell towers built closer to each other.